There is plenty to be disappointed about in this upcoming presidential election. More often than not the American public is forced to choose between the lesser of two evils. The two major party system is corrupted. The Citizens United decision that allowed money to be speech has left us at the mercy of the super -rich. The corporately owned media pushes the agenda of the corporate power structure. Propaganda replaces news, lies are considered the new truth. We are left with puppets that cover their true agenda by only addressing issues that divide us. They constantly point fingers and give people a scapegoat to blame for policies that they created or supported. They tell you that the government is broken while they themselves serve in the government. They have bastardized our system so badly that they have driven many people away in disgust. Another large portion of our electorate is distracted by consumerism. The corporate powers that be have seen to it that they provide so many distractions you unwillingly surrender to their will. Too many of us have become so obsessed with the date the new I-Phone is released that we forget the date of election day. More people in this country can name the judges on The Voice than can name judges on the supreme court. More people know every rule in Football but don’t know how the local assembly differs from the Congress. Civics has become a thing of the past in our school system. It has been replaced by more intense focus on Math and Reading so that a fresh crop of worker bees can be raised to properly perform their job function without the burden of free expression or creative thought. So many have become disillusioned that they stay away from the process. They feel as if they don’t have a say, so they don’t say anything. They feel as though their actions are useless, so they don’t act. They feel the government doesn’t work so why bother? The major flaw in this thinking is that the government works just fine. Corporate entities that lobby and create laws are taking full advantage of how government works. They are busy convincing you that the government doesn’t work, they are just leaving out the part that it doesn’t work for you. The main reason it doesn’t work for you is because YOU don’t participate. YOU allow it to be taken from you. 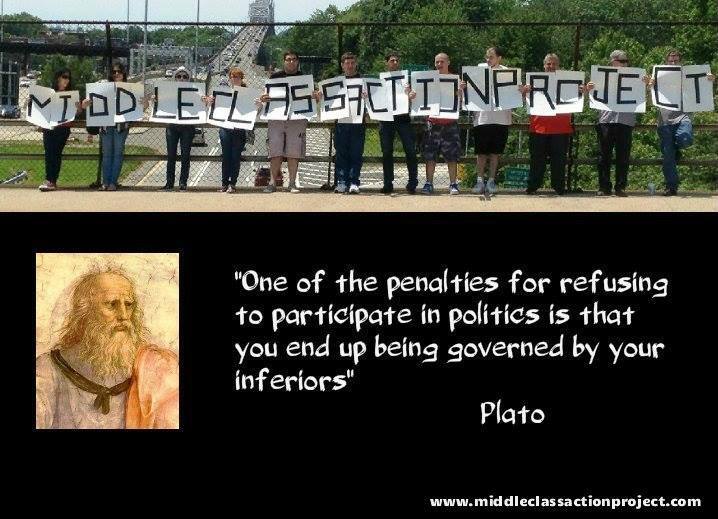 The founding Fathers created a system of government that relies on participation by the people. The reason The United States was formed was because the people were tired of being ruled by an elite power structure that offered them no voice. Two hundred and forty years later and the people are surrendering their power back to an elite power structure. If you think your vote doesn’t count, think again. If you dislike the candidates, get involved and find and support one that you do. Pay attention to what happens in Congress. We are not ruled by a King anymore. The President is not the be all and end all when it comes to governing. Pay attention to your local government as well. Many of the decisions that affect you the most aren’t even made in Washington but in your local state houses. It’s ok to be a member of a political party but you don’t have to defend that party to the death. Make your decisions based on which candidate will best serve you and your communities best interests. Contact your elected officials and tell them what you expect of them. They work for YOU, literally. Their salaries are paid for with your tax money. YOU are their boss. When you surrender that power you are handing it over to someone else that will gladly take it and use it to their advantage. If you are so angry with the current system and want to send the powers that be a message, not voting doesn’t accomplish that. In certain instances the politicians want you to stay home because they know their die-hards will show up and steal the election for them. There is a way to show your discontent with the chosen candidates. You can vote for a third party candidate. You can use the write in option. Vote for yourself if you have to but VOTE. Take part in the process, show them that you are not going to just sit back and take it. Take back the power.